(1) Study on utilization of rice straw by ruminants supplemented with Agricultural by-products available in Myanmar. 1. Effect of level of rice bran on voluntary intake of rice straw and digestibility of rice straw diet in growing bulls. (2) Study on utilization of rice straw by ruminants supplemented with Agricultural by-products available in Myanmar. 2. Effect of groundnut meal or sesame meal with or without chickpea (Cicer Arietinum) husk on voluntary intakeof rice straw and digestibility of rice straw diet in growing bulls. (3) Physiological responses of growing bulls to rice straw diet supplemented with groundnut meal and sesame meal with or without chickpea (Cicer Arietinum) husk. Proceedings of 7th Veterinary Conference, Yangon University Diamond Jubilee hall. 24 th –25 th October 1998. Myanmar Veterinary Association, Myanmar. (4) Survey on comparison of prices of poultry foodstuffs and egg price in Pyinmana area from 1994 to 1998. Proceedings of 9th Veterinary Conference, Yangon University Diamond Jubilee hall. October 2000. Myanmar Veterinary Association, Myanmar. (5) Study on utilization of rice straw by ruminants supplemented with agricultural by-products available in Myanmar. 3. Effect of heat-treated sesame meal on voluntary intake of rice straw diet and nitrogen balance in growing bulls. Proceedings of the annual research conference held in Yangon on April 3 – 5, 2000. ( Live stock and Fishery Sciences). Myanmar Academy of Agricultural,Forestry, Livestock and Fishery Sciences. August, 2000, Yangon, Myanmar. Pp:145 – 156. (6) Sugar cane bagasse as the roughage in blended ration for growing bulls in Myanmar. Proceedings of the annual research conference held in Yangon on May 4 – 6, 2001. (Livestock and Fishery Sciences). Myanmar Academy of Agricultural, Forestry, Livestock and Fishery Sciences. August, 2001, Yangon, Myanmar Pp: 192 – 204. (7) Effect of combination of untreated or heat-treated saseme meal and two rates of chickpea (Cicer Arietinum) husk to supplement urea-treated rice straw for growing bulls. Proceedings of the annual research conference held in Yangon on May 4 – 6, 2001. (Livestock and Fishery Sciences). Myanmar Academy of Agricultural, Forestry, Livestock and Fishery Sciences. August, 2001, Yangon, Myanmar Pp: 64 – 83. (8) Study on the growth performance and biochemical response of Rhode-Island Red cockerel to three different levels of dietary protein. 7th. Myanmar Veterinary association, Diamond Jubilee Hall, Yangon, Myanmar. (9) Studies on the physiological responses of growing bulls fed on urea-treated rice straw with untreated or heat-treated sesame meal and two rates of chickpea (Cicer Arietinum) husk. Proceedings of the annual research conference held in Yangon on June 28– 30, 2002. (Livestock and Fishery Sciences). Myanmar Academy of Agricultural, Forestry, Livestock and Fishery Sciences. August, 2002, Yangon, Myanmar Pp:155 – 167. (10) Effect of chickpea husk, as a source of easily digestible fibre, on in vitro and in vivo digestion of rice straw. Proceedings of the annual research conference held in Yangon on December 10 – 12, 2003. (Livestock and Fishery Sciences). Myanmar Academy of Agricultural, Forestry, Livestock and Fishery Sciences. February, 2004, Yangon, Myanmar. Pp: 52 – 78. Proceedings of the annual research conference held in Yangon on December 10 – 12, 2003. (Livestock and Fishery Sciences). Myanmar Academy of Agricultural, Forestry, Livestock and Fishery Sciences. February, 2004, Yangon,Myanmar. pp:107 – 119. Proceedings of the annual research conference held in Yangon on December 10 – 12, 2003. (Livestock and Fishery Sciences). Myanmar Academy of Agricultural, Forestry, Livestock and Fishery Sciences. February, 2004, Yangon, Myanmar. Pp: 163 – 175. (13) Effects of chickpea (Cicer arietinum) husk with or without polyethylene glycol and detannined chickpea husk on in vitro fibre digestion of rice straw diet. Myanmar Veterinary Journal. The Journal of Myanmar veterinary Association. Annual Conference Edition. November 2004. Pp: 31-42. (14) Effects of lablab bean (Dolichos lablab) husk and chickpea (Cicer arietinum) husk, as tannin sources, on nutrients digestibility and nitrogen utilization in sheep. Myanmar Veterinary Journal. The Journal of Myanmar veterinary Association. Annual Conference Edition. December 2005. Pp: 35-42. Proceedings of the annual research conference held in Yangon on December 7 – 8, January,2005. (Livestock and Fishery Sciences). Myanmar Academy of Agricultural, Forestry, Livestock and Fishery Sciences. January, 2005, Yangon,Myanmar. Pp: 160 – 189. Myanmar Veterinary Journal. The Journal of Myanmar veterinary Association. 10th Veterinary Conference. November 2006. Pp: 31 – 37. Myanmar Veterinary Journal. The Journal of Myanmar veterinary Association. 10th Veterinary Conference. November 2006. Pp: 15 – 22. Myanmar Veterinary Journal. The Journal of Myanmar veterinary Association. 10th Veterinary Conference. November 2006. Pp: 7 – 14. Proceedings of the annual research conference held in Yangon on May 25 – 27, 2006. (Livestock and Fishery Sciences). Myanmar Academy of Agricultural, Forestry, Livestock and Fishery Sciences. May, 2006, Yangon,Myanmar. (21) Effect of feeding frequency of leucaena leucocephala, as a source of easily digestible fibre, on nutrients digestibility and nitrogen utilization of rice straw diet fed to goat. Myanmar Veterinary Journal. The Journal of Myanmar veterinary Association. Annual Conference Edition. November 2007. Pp: 88 – 95. Myanmar Veterinary Journal. The Journal of Myanmar veterinary Association. Annual Conference Edition. November 2007. Pp: 9 – 18. Myanmar Veterinary Journal. The Journal of Myanmar veterinary Association. Annual Conference Edition. November 2007. (11)1: 75 – 83. Myanmar Veterinary Journal. The Journal of Myanmar veterinary Association. Annual Conference Edition. November 2007. (11)1: 105 – 110. 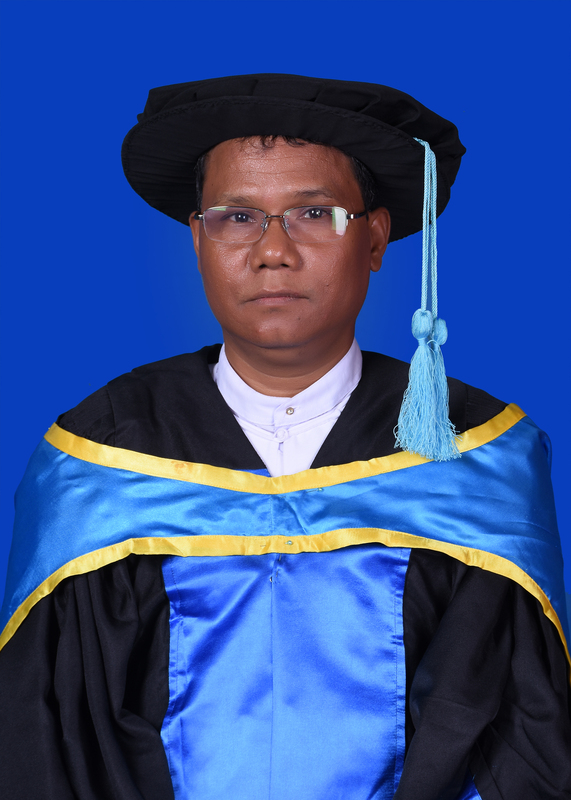 (26) The study on the milk production in cross-bred Holstein Friesian lactating cows with the special reference of nutritional requirement in Myanmar. Myanmar Veterinary Journal. The Journal of Myanmar veterinary Association. Annual Conference Edition. November 2007. (11)1: 85 – 93. Proceedings of the annual research conference held in Yangon on July 25 – 26, 2008. (Livestock and Fishery Sciences). Myanmar Academy of Agricultural, Forestry, Livestock and Fishery Sciences.Nay Pyi Taw, Yezin, Myanmar. pp: 141 – 156. Proceedings of the annual research conference held in Yangon on July 25 – 26, 2008. (Livestock and Fishery Sciences). Myanmar Academy of Agricultural, Forestry, Livestock and Fishery Sciences.Nay Pyi Taw, Yezin, Myanmar. Pp: 176 – 190. Proceedings of the annual research conference held in Yangon on July 25 – 26, 2008. (Livestock and Fishery Sciences). Myanmar Academy of Agricultural, Forestry, Livestock and Fishery Sciences.Nay Pyi Taw, Yezin, Myanmar. Pp: 74 – 88. Proceedings of the annual research conference held in Yangon on July 25 – 26, 2008. (Livestock and Fishery Sciences). Myanmar Academy of Agricultural, Forestry, Livestock and Fishery Sciences.Nay Pyi Taw, Yezin, Myanmar. Pp: 116 – 140. Proceedings of Annual Meeting of Myanmar Veterinary Association, 2008, Convocation Hall, University of Veterinary Science, Nay Pyi Taw, November 23th – 24h , 2008, pp 13-18. Proceedings of Annual Meeting of Myanmar Veterinary Association, 2008, Convocation Hall, University of Veterinary Science, Nay Pyi Taw, November 23th – 24h , 200, 73-84. Proceedings of Annual Meeting of Myanmar Veterinary Association, 2008, Convocation Hall, University of Veterinary Science, Nay Pyi Taw, November 23th – 24h , 2008, pp 103-112. Proceedings of Annual Meeting of Myanmar Veterinary Association, 2008, Convocation Hall, University of Veterinary Science, Nay Pyi Taw, November 23th – 24h , 2008 , pp, 95-102. Proceedings of Annual Meeting of Myanmar Veterinary Association, 2008, Convocation Hall, University of Veterinary Science, Nay Pyi Taw, November 23th – 24h , 2008 13-18. Proceedings of Annual Meeting of Myanmar Veterinary Association, 2008, Convocation Hall, University of Veterinary Science, Nay Pyi Taw, November 23th – 24h , 2008 , pp 85-94. Proceedings of Annual Meeting of Myanmar Veterinary Association, 2008, Convocation Hall, University of Veterinary Science, Nay Pyi Taw, November 23th – 24h , 2008, pp 113-120. The Journal of Myanmar Veterinary Association, Vol. 14: 1, Annual Conference Edition, Dcember 2011, Pp 25-38. The Journal of Myanmar Veterinary Association, Vol. 14: 1, Annual Conference Edition, Dcember 2011, Pp 39-48. The Journal of Myanmar Veterinary Association, Vol. 14: 1, Annual Conference Edition, Dcember 2011, Pp 55-66. Proceeding of the annual research conference held in Nay Pyi Taw on December, 2009 (Livestock and Fishery Sciences). Myanmar Academy of Agricultural, Forestry, Livestock and Fishery Sciences. Nay Pyi Taw, Yezin, Myanmar. The Journal of Myanmar Veterinary Association, Vol. 15: 1, Annual Conference Edition, Dcember 2013, Pp 69-77. (3) The study of laying performance and physiological values following vitamin C loading in pullets. (Moe Thida Htun, M.V.Sc, 2001).